Make weeding easier and faster! - Are you sick of hand soreness and blisters from uncomfortable weeding? - Are you spending hours pulling pesky weeds from your garden? - Does your weeder wear out or break after a few weeding sessions? Introducing GUP Gardening's new weeder! 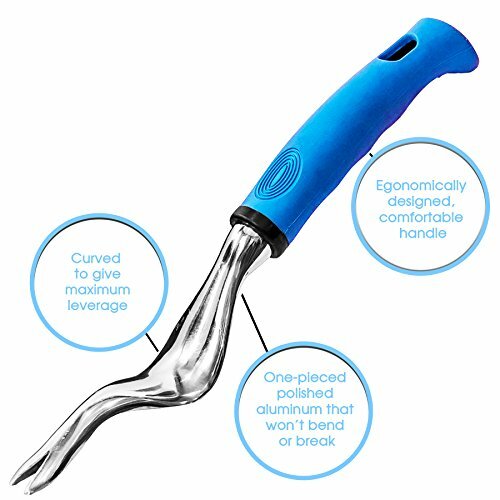 - Curved shaft gives the leverage you need to make weeding easier and faster! Amazon buyers trust our GUP Gardening weeder to be a quality premium product backed by a lifetime warranty! No questions asked! Click now! We can not guarantee this special pricing! HOW WE ARE DIFFERENT: Unlike cheaper yard tools that tend to wear out over time, GUP Gardening manual weed picker is built to last. It is made of sturdy aluminum that wont bend, break or rust. It is light weight yet sturdy and can be counted on to perform even in the toughest soil. This weeder is designed so you don't have to dig a wide hole to get the entire root. This reduces the amount of good grass and good seeds from being pulled. SUPERIOR DESIGN: The bend design in the shaft gives you more leverage than the traditional straight shaft that most weeders have, acting as a fulcrum when prying out stubborn weeds. It also features a sharp "V" shaped blade, which allows you to cut deep into the soil and grab weeds at the root. Once the blades have captured the weed, all you do is push down on the handle and our weeder pulls the weed and root out in one easy maneuver. EASY STORAGE: This weed extractor features a ring on the handle which allows for hanging after use. You no longer need to search through drawers or scour you woodshed just when you need it the most. This weed grabber is a perfect gift for any amateur or professional gardener alike. OUR PROMISE: GUP Gardening offers complete customer satisfaction, period. We have hundreds of happy customers. If for any reason you are not absolutely happy with your weed plucker, GUP Gardening will replace or refund your order, no questions asked. CONTACT US directly and we will take care of you. If you have any questions about this product by GUP Gardening!, contact us by completing and submitting the form below. If you are looking for a specif part number, please include it with your message.